If I Could See (What The Angels See) – Life would be so easy if we could see thru the eyes of Angels. Amy Grant talks about the simplicity of believing and trusting in God if she had a vision of the world the way Angels do. Its an upbeat and happy tune. This is a great morning song! Better Not to Know – Live life one day at time and don’t worry about tomorrow! She expresses the idea that its best not to know about the future (example: when we will die). We work hard in our lives and its best to live in the moment instead of agonizing about what will happen. The slow tune helps you reminiscence about the past and enjoy the good times. Don’t Try So Hard (with James Taylor)– God’s grace is there for all Christians. You don’t have to be perfect. Jesus Christ was given for the sins of the world. Christians aiming to be perfect in life is not necessary…. all you have to do is open your heart to God and give your life to Him. Trying so hard will wear you out! The single is a country infused-CCM tune that is pleasing to the ear and relaxes your nerves. Deep As It Is Wide (featuring Sheryl Crow & Eric Paslay) – Have you discovered true love? Amy, Sheryl and Eric have! The three team up to sing a song about realizing God’s love is the most truthful and deepest love there is. When you receive eternal life, you can finally experience God’s deep love in Heaven. Its a rock/country tune that ends with a glorious choir accompanying the three singers. Here -Everything in the world represents God being there with you. The beauty of nature, music and just about anything that goes on in life …. Amy believes it means God is saying “I Am Here”. “Here” is a track that reassures you are not alone in the world. Shovel In Hand (with Will Hoge) – Experiences in life mature people. Amy describes how her son became a man after “burying a friend”. Her son grew up due to the adult experience. The country/bluegrass song is shocking with its poignant lyrics. Golden -I feel this is Amy’s version of Britt Nicole’s “Gold”. She reassures Christians that they are loved no matter what. Christians are “golden” to God. Despite the trials you face, God loves you and will be with you. Our Time Is Now (with Carole King) – Don’t waste a year! Time flies and Amy tells her listeners she has to “sing” before her time runs out. I feel this song expresses the need to live life to the fullest and do as much as you can in this life before its over. The message is strong yet the music makes you want to get up and do a square dance. “Our Time Is Now” is a very energetic tune with a lot of heart. Not Giving Up – Have you ever given up on life? Well, Amy describes her desire to never give up on a loved one. No matter how hopeless they feel, she will always be there for them. She cherishes them. The beautiful ballad tugs at your heartstrings. How Mercy Looks From Here – God’s mercy is there thru it all. Whether you have faced the storms of life and overcome or lost a child, the mercy of God is there and His angels surround you. Scottish bagpipes illuminate the end of the melancholy song. Greet The Day – Amy greets the day by doing good deeds for others and looking to help people. Greeting new days should be full of happiness and a willingness to serve others. “Greet The Day” will have you dancing every morning anticipating a great day! “How Mercy Looks From Here” releases in stores on May 14th, 2013. This entry was posted in Music, Reviews and tagged Amy Grant, How Mercy Looks From Here, Sheryl Crow. Bookmark the permalink. You’re Welcome. 🙂 I’m glad you enjoyed reading my review. BTSCelebs will have a another special event regarding her album as the release date nears. If you are a Amy Grant (and CCM fan), I promise it will be worth the wait. 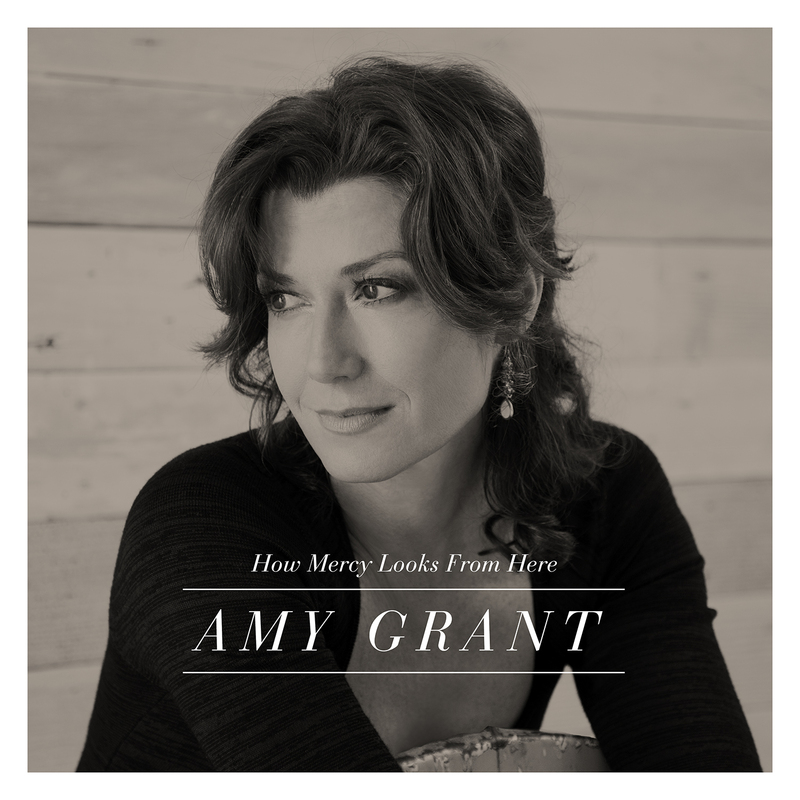 Can’t wait for the new album “How Mercy Looks From Here” from Amy Grant. Don’t Try So Hard is a beautiful song with so much meaning. Great review!! Amy Grant is the greatest. She writes from the heart and catches everybody’s attention. Thanks for the review! !